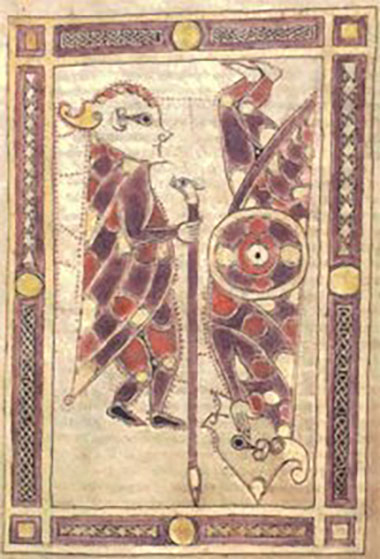 The Anglo-Saxon, Norse, and Celtic Tripos is concerned with the history, literature, language and material culture of Britain, Ireland and Scandinavia in the early medieval period (from about the fifth century to the twelfth). It appeals to anyone with an interest in medieval history and/or literature and/or early languages, and in particular to those who would like to continue their study of both literary and historical topics at the same time. No previous knowledge of the subject is either expected or assumed. The subject as studied is very much source-based and students are taught how to analyse different kinds of primary evidence and to read texts in their original languages. The range of subjects on offer is wide and varied, enabling students to place the emphasis where they choose. Most will combine language and literature papers with historical ones. However, it is also possible to focus predominantly on history, on the one hand, or on language and literature, on the other, or to study mainly Celtic or Germanic peoples. Whatever a student’s subject choices, study of them will involve getting to the heart of the matter, the original manuscript work or artefact ever at the core. The course is divided into Part I (two years) and Part II (one year), and skills acquired during the foundation years of the course (Part I) are applied at a more advanced level at Part II, as students pursue their own particular interests in greater depth. Six papers (courses) are taken in Part I, and may include Anglo-Saxon History, Scandinavian History, Gaelic History, Brittonic History, Insular Latin Language and Literature, Old English Language and Literature, Old Norse Language and Literature, Medieval Welsh Language and Literature, Medieval Irish Language and Literature, Palaeography and Codicology, as well as papers borrowed from other degree programmes (e.g. English, History, Archaeology, Medieval and Modern Languages). Students choose five options for Part II, one of which is a dissertation on a topic of their choice, and as the opportunities for original research are great in our subject, many of these have made a real contribution to scholarship. Anglo-Saxon, Norse, and Celtic has a long, distinguished tradition at St John’s. In fact, the earliest manuscript in the College’s library is a tenth-century Irish manuscript known as the ‘Southampton Psalter’ acquired by the College in the sixteenth century. The Library has acquired much additional material in our subject since then! ASNC students are entitled to generous book grants to enable them to purchase essential works, as well as financial assistance towards attending language courses and visiting sites in Britain, Ireland, Brittany and Scandinavia. Moreover, Trinity College Dublin is one of St John’s two ‘sister’ colleges. The College Archivist also offers free Palaeography lessons (the study of old handwriting) held in the School of Pythagoras, the oldest building in St John's College and the oldest extant secular building in Cambridge. St John's has a relatively large body of graduate students who very much contribute to the vibrant subject community. Typical offer levels are: A-Level A*AA and IB 40-42, with 776 at Higher Level. No previous knowledge of the subject is expected or required; all languages are taught from scratch and we do not assume that applicants have studied early medieval history or literature at school. Useful preparation subjects can include English (Language or Literature), History, a language (ancient or modern). As part of your application you will need to sit the University's Pre-Interview Assessment for Anglo-Saxon, Norse, and Celtic. More information is available here. In advance of interview you will be asked to submit two school/college essays as examples of written work. Those who are invited to attend for interview will have two interviews: one with the Tutor for the subject and one with the Director of Studies and another member of the Department. The aim of these interviews which last upto 30 minutes each, is to find out about your motivation and aptitude for Anglo-Saxon, Norse, and Celtic. We will not assume any knowledge of the subjects we teach but will be interested in how you approach language, literature and history, the three key areas of our course of study. To this end, we may ask you about certain topics you have studied at school, or about other relevant activities you have undertaken. We conduct our interviews in a friendly and informal manner, and you should not feel daunted by the prospect of them. ASNC students acquire many transferable skills over the course of their degree programme, including critical thinking, source analysis, and working as part of a team. These skills, as well as their intellectual curiosity and versatility make them highly sought after by employers. They obtain jobs in a wide range of professions. These include business, banking, consultancy and management, law, teaching, the media, the heritage sector, the diplomatic and civil service to cite but a few examples. Former ASNC students, including St John's alumna Carly Hilts, have shared their impressions of life after ASNC on the Department website, here. The ASNC Department website contains full details of their activities and of the subjects studies. Information for prospective undergraduates can be found here and details of the department's annual Open Day can be found here.